The year 1988 was the last year Formula 1 heard the hissing of a turbo powered engine running at 1,300 horse power. The year 1988 was when the sport was at the pinnacle of power – full on extreme power from an engine at maximum revolutions with no second thought at the consequences to the environment. The year 2010 is quite different. The economic crisis has exploded and transformed every platform involved with money. Formula 1 turned immediately to cutting costs. Cutting costs is great as long as the FIA can maintain an entertaining show for its fans and keep F1 at its current popularity level. “It’s believed that such a move would not only bring a number of (currently hesitant) sponsors on board, but could also lead to manufacturers entering the series, Audi being the first name that spring to mind,” reads the Pitpass.com article. I remember several years back when the race footage would switch onto the on-board camera. The RPM gauge would appear to the left as the car roared by at 19,000 revolutions per minute. At times they even almost hit 20. That was great to see. As a motorsport fan, you can’t help but want more and more – more speed, more overtaking, more revolutions per minute. The FIA then put a rev limiter and we had to look elsewhere for more. Several reports say 2011, others say 2013. 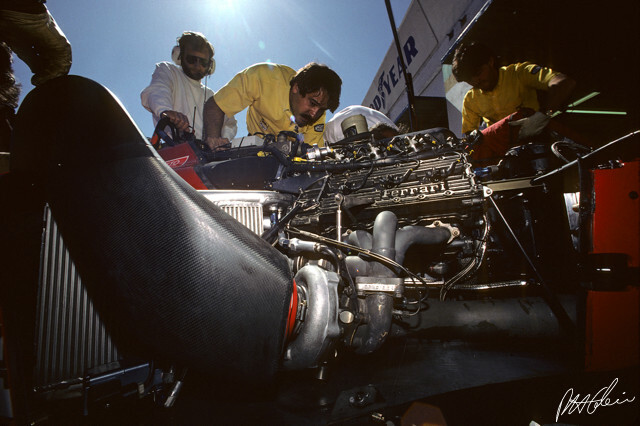 All of them, however, are certain that the turbo-charged engine could return to Formula 1. Re-introducing a turbo means F1 cars can run on smaller engines, which also means smaller budgets and smaller CO2 emissions. In order to counter the possibility of such a combination being detrimental to the sport, the FIA also plan to re-introduce KERS. I am all for it. I am all for the change for protecting the planet and reducing spending. All I am interested in is that the end result is good for the fans and for the sport. “The concept of a 2.4-litre V8 is getting a little bit dated now,” he continued, “and I think the move to turbo-charged engines with KERS is the right thing to do. Obviously Formula One does need to maintain itself in terms of being at the pinnacle of motorsport and engine performance. Somehow we’ve got to come up with an engine formula that is associated with high performance but also with fuel efficiency and modern technology. So overall I think we’re moving in the right direction and we fully support it,” says Tim Gross, McLaren’s Chief Engineer in a report on Pitpass.com. All in favor of a ‘Turbo’ say I.